Paldor lies at the south-east end of Ganesh Himal marking the junction of the Tiru and Karpu Dandas at the head of the Mailung Khola, a tributary of the Trisuli Gandaki River. The name Ganesh is taken from the elephant-headed Hindu god of good luck, probably the most popular deity in the Kathamndu valley. On a clear day the Ganesh Himal, with the icy fangs of Pabil (7,101m/23,300ft), Logsang Karpo (7,150m/23,458ft), Ganesh I (7,406m/24,298ft) and Ganesh V (6,950m/22,802ft) can be seen forming an imposing backdrop to the north-west of Kathamndu. The quickest approach to Paldor and Ganesh Himal is from Sabru near Dunche in the Trisuli valley which can be reached in a 6 to 7 hours drive from Kathmandu. From here the trail crosses the Langtang Khola to Sabrubesi. After crossing the Bhote Kosi river the route leads via Tamang villages of Tangjet and Gatlang, then heads northwards along the ridge before dropping into the forest above Mailung Khola to pick up the newly built road that leads to an army post. The moraine filled valley below Paldor is reached from here in another days walk. A more interesting approach is the trek from Sundarijal (on the outskirts of Kathmandu valley) through the hills of Helambu and over the Gosainkunda range to Sabru. The return from the mountain can be made by trekking directly to Trisuli Bazaar in about 4 or 5 days from where a drive of about 3 hours bring one back to Kathmandu. North – East Ridge: From base camp, follow a path below the conspicuous moraine on its east side as far as Paldor Tarn. Here there is a small and inconspicuous lake to the south of the peak called Fang. Cross the stream issuing from the lake and aim for the east ridge of Fang. This boulders slope is the Paldor Glacier east at an altitude of 5,200 meters, in a magnificent amphitheater of alpine – scale peaks. The glacier at this point is flat and uncomplicated by crevasses. 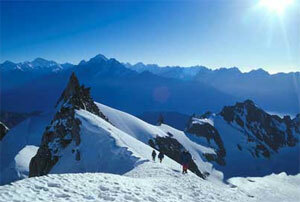 From high camp follow the Paldor Glacier, East, without difficulty, north towards a col on the North – East Ridge. Cross the bergscrund and climb a steep snow slope to gain the col. This may be very difficulty, in which case ascend the slope to the left, climbing diagonally towards a rocky pinnacle. Once on the ridge, climb over several pinnacles of loose rock leading to a horizontal snow arête that narrows dramatically. Follow this foot of the final 150 meters (492 feet) headwall. Ascend this on steep snow to the junction of the South-East Ridge, which may be corniced. Continue easily to the summit. This is Alpine AD climbing and takes five to seven hours from high camp. South – East Ridge: John Cleare and Ian Howell first climbed this in 1974. Between Tilman’s ascent in 1949 and Cleare’s expedition of 1974 it is possible that Paldor had no other ascents. Since then the mountain has received more attention and many new routes added. This route climbs the long snow and ice arête that descends to the fine rock peak of Fang. The lowest point of this ridge is best reached, from a high camp on the Paldor Glacier East, by a steep snow and ice slope (55 degrees). The ridge has also been reached via a potential avalanche couloir from the Paldor Glacier West. The ridge is above is followed, in places quite steeply, but without major difficulty to the summit. A combination of both these routes has been made as a traverse and is highly recommended.